An Arkansas fishing mark that had held for nearly 33 years finally fell last weekend when a Kansas angler making an annual trek with friends to the White River pulled in a cutthroat trout. MOUNTAIN HOME, Ark. 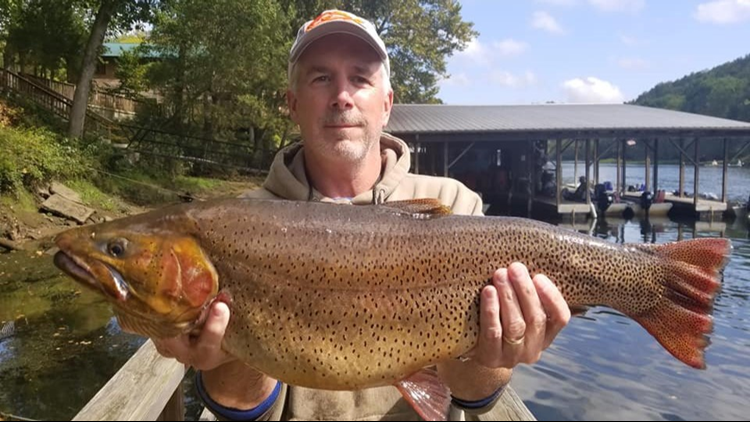 – An Arkansas fishing mark that had held for nearly 33 years finally fell last weekend when a Kansas angler making an annual trek with friends to the White River pulled in a cutthroat trout weighing 10 pounds, 2 ounces. The catch was certified by the Arkansas Game and Fish Commission’s chief of fisheries today. Mike Bowers of Abilene, Kansas, who said he has fished these waters for longer than the record had held and who makes two or three trips to Arkansas’s northern trout streams each year, caught the 26-inch-long trout on a No. 15 baitholder hook with salmon eggs in the Norfork Tailwater (North Fork of the White River). He landed it in front of Gene’s Trout Fishing Resort. At first, he and his fishing partner, Jack Wickersham, thought Bowers had a brown trout on the line before pulling it in and noting the distinctive cutthroat marks. Onlookers at Gene’s sensed it was something special, and the scale on the dock indicated as much. The trout was caught during a minimum flow period on the river, about 12:30 p.m. on Saturday, Sept. 29. Bowers and Wickersham docked immediately to weigh the fish and, knowing it was likely a record-breaker, headed to Mountain Home for official weigh-in with Arkansas Game and Fish Commission fisheries biologists. Christy Graham, the AGFC’s trout management program supervisor, certified the weight. Graham says the cutthroat was confirmed to be one raised by the U.S. Fish and Wildlife Service’s Norfork National Fish Hatchery and stocked in either 2008 or 2011 – she said there was no way to confirm which of those years exactly. Graham said that at some point, state records for all four species of trout (rainbow, brown, cutthroat and brook) have come from the Norfork Tailwater. The AGFC’s current cutthroat trout minimum length limit on the Norfork Tailwater of 24 inches (one fish per day) took effect Jan. 1 of this year, and should help protect and grow larger fish. Bowers said he plans to have the record fish mounted by a taxidermist with a natural bed mount to resemble the bottom of the Norfork Tailwater. He said he and the 29 other friends from coast-to-coast that were making a long weekend of fishing out of Gene’s Resort for the 18th straight year pride themselves on turning most of their catch back to the river.